Saturday afternoon I was running a few light errands with my older cousin Mia in the popular Clinton Hills area of Brooklyn, NY when she decided to make a quick trip into Karen’s Body Beautiful, a hair store that specializes in hair products that have natural ingredients. 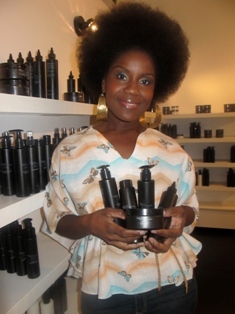 I’ve heard of KBB through blog sites, but I’ve never bought into purchasing a lot of the “natual hair” products because I have failed to see how they’re so much better than more commercial options. I should also mention that about a year ago I tried out Carol’s Daughter’s Hair Milk and hated it which also helped inspire my decision. So Mia and I were in KBB because Mia believes in all natural, organic EVERYTHING. Since she’s 9+ months pregnant right now (she’s due in two weeks) she needed some baby lotion for Solomon, her son. After visiting the store and discovering that there were none in stock, Karen, the creator of KBB came out and whipped some up for Mia right then and there! Yes you all, she MADE it RIGHT THERE! Behind the counter were KitchenAid mixers and Karen created Mia’s shea butter cream, packaged it, then sold it. I myself was fiddling around with a leave-in conditioner, Hair Nectar, that left my hair feeling light, soft and smooth. I made the executive decision to purchase it right then and there. As of today, two days later I am still incredibly pleased with my results. My hair is incredibly soft, moisturized and has wonderful curl definition. An added plus is the smell is nothing short of heavenly. Karen featurs at least 6 different scents-while Mia favors the cranberry scent, I went with White Tea. Furthermore, it is comforting and reassuring to know that my hard-earned money went towards supporting a Black woman’s company that is aimed at selling hair products to all. Sounds like a fantastic store!